Our Calla Barn Lights Combine Vintage Lighting With Cutting-Edge LED Lighting! 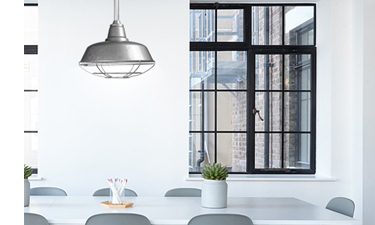 Our Calla Barn Light features a smooth, sloping shade that’s perfect for both storefronts and at home! Classically modern, the wide-angled shade of this lamp fills your spaces with a vibrant illumination perfect for both interior lighting in your kitchen and landscape lighting for the great outdoors! Perfectly sized for outdoor lighting, the Calla is available in 12”, 14”, 16”, 18”, and 20” sizes. Whether it’s lighting for your garage or authentic country barn, the Calla pairs perfectly with any of our 7 gooseneck arm styles to make the perfect fixture for your outdoor lighting. 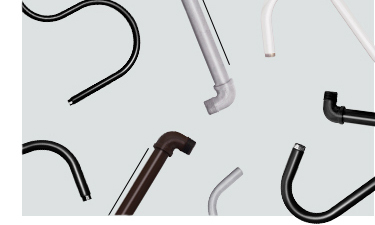 The Calla comes in Black, White, Jade, Vintage Green, Galvanized Silver, and Mahogany Bronze finishes. The Calla features a high quality steel frame that’s coated with a water-resistant finish for outdoor use. Our Calla barn lights are MET listed for outdoor weather conditions. 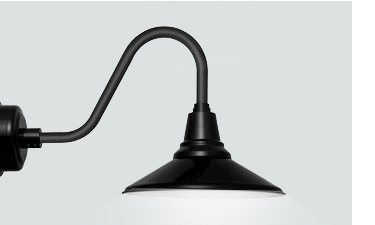 This powder coating allows the lamp to resist fading and chipping as well, preserving the look of your lamp over time. Rain or shine, Cocoweb Barn Lights are built to last. The Calla produces a warm yellow illumination from its integrated LED bulb. Our patented LED technology works at peak energy efficiency to produce a brighter light than a 100W screw-in bulb and use only a quarter of the electricity. Best of all, our LEDs last for over 50,000 hours and are fully dimmable! Our LED Barn Cage lights are designed for use in all environments including barns, livestock buildings, warehouses, workshop garages and more. It’s Energy Efficient and Customizable! We offer a variety of barn lights to pick and choose from that fits your ideal style along with our Wire Cage LED Barn Light! Our high-quality barn lights are susceptible to be mounted on walls or even hang on ceilings. Get a decorative, industrial vintage style with the wire cage light guard. The cage is designed with contoured bars to protect the LED light bulb while allowing a large and accommodating light to shine through. Made from steel and completed with a Silver coating, our Barn lights are ideal in any location for the indoor or outdoor! Cocoweb LED Barn lights contains patented technology that helps increase safety, security and conveniences around the home and installs anywhere in minutes. The LED photocell base is great for the outdoor wall by illuminating several essential areas around your home. These units detect natural light and turn on the lights after sunset. They also shut everything down when the sun rises, so nothing burns power during the day. 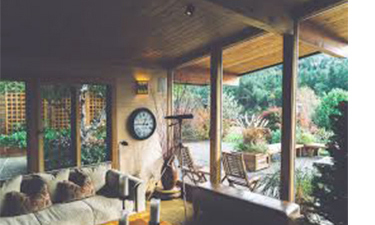 They can also serve as theft deterrents, giving many reasons why homeowners leave their light on throughout the night. *Not compatible with exposed junction box/wiring. The Calla features a high quality steel frame that’s coated with a water-resistant finish for outdoor use and is Our Calla barn lights are MET list for outdoor weather conditions. 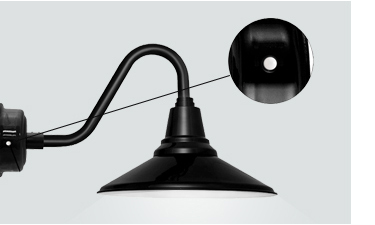 This powder coating allows the lamp to resist fading and chipping as well, preserving the look of your lamp over time. Rain or shine, Cocoweb Barn Lights are built to last. Integrated with the latest in LED lighting technology, our gooseneck barn lights shine with a warm yellow illumination. 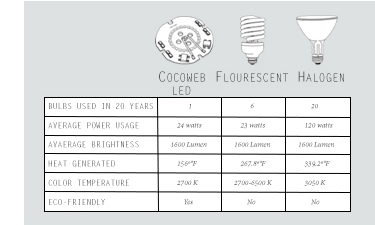 Cocoweb LEDs work at peak energy efficiency to produce a light that’s brighter than a 100W screw-in bulb and uses only a quarter of the electricity. Best of all, our Barn Lighting LEDs last for over 50,000 hours and are fully dimmable! Our Calla Barn Lights come in a variety of different wall and floor installations to match perfectly with every area of your home! 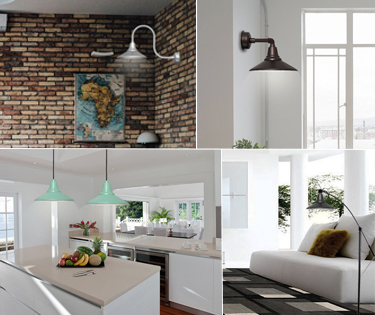 Complete your design with our Calla Pendant Lamps, Wall Sconces, Floor Lamps, and Sign Lights!